Are you confident to adapt clothes to fit?? I know I’m not.. I’ve been watching the Great British Sewing Bee avidly, wishing I had the skills of the contestants. For those who do not live in the UK it a contestant show where the contestants are set sewing tasks, to find the best amateur UK sewer. The first weeks tasks were to sew an A line skirt with invisible zip in 4 hrs, adapt a neckline of a white blouse in an hr, and sew a dress adapted to fit their model in 7 hours. I had seen the program advertising for contestants and had for a brief moment toyed with the idea.. thank goodness I never applied! To start with I have decided to adapt clothes from charity shops/jumble sales. I started off looking at patterns, but soon became discouraged. Instead I laid out a dress my daughter has which fits, and used it as a template. 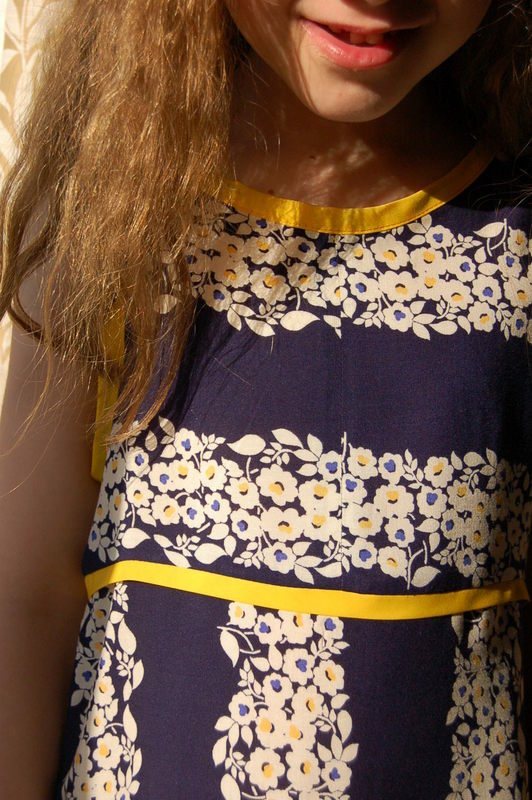 Bias binding seemed the obvious choice for the neckline, and the yellow picks out the colour in the flower. Overall I am delighted with the result, a dress for £1:) The neckline is baggy, but as she rarely wears dresses I am not too worried about this (I like her to have some dresses in her wardrobe so she has a choice to wear a dress). Other sewing this week has been finishing those bits and pieces that kick around.. repairs to clothes, altering a dress for a friend to become a dressing up outfit etc.. Happy Earth Day! Found you from the Linky Party! I’ve been wanting to upcycle from used dressy tops/dresses for quite awhile, but it’s mildly intimidating. But I LOVE the idea of starting with kids’ clothes! It seems much more manageable, thanks for the inspiriation! I adore that dress! I might have to do something similar for my daughter. I have pair of jeans that are badly frayed around the hem. I would like to upcycle them into a pencil skirt. I’m always cutting up jeans to make bags but making them into a garment to wear and show people is something else. I might give it a go. I would love to have a go at a denim skirt out of jeans, but it’s always the waist where they don’t fit… one way or another!!! That dress is beautiful! 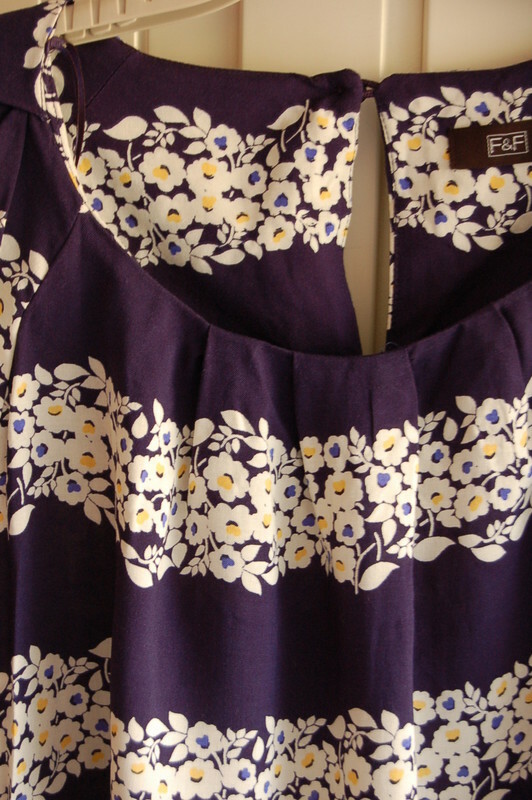 I have never really thought about restyling old clothes, although I seem to have stopped recycling them via charity shops because I think the fabric/trim/logo might come in handy one day. Perhaps I ought to have a rummage through my own cupboards! What is the betting she lives in that dress this summer? Great make. I really should go to charity shops more it is just finding the time! Love the redo — especially the yellow bias! Great compliment to a great dress. I am really enjoying the programme, but find the idea of sewing to time pressure truly horrific. 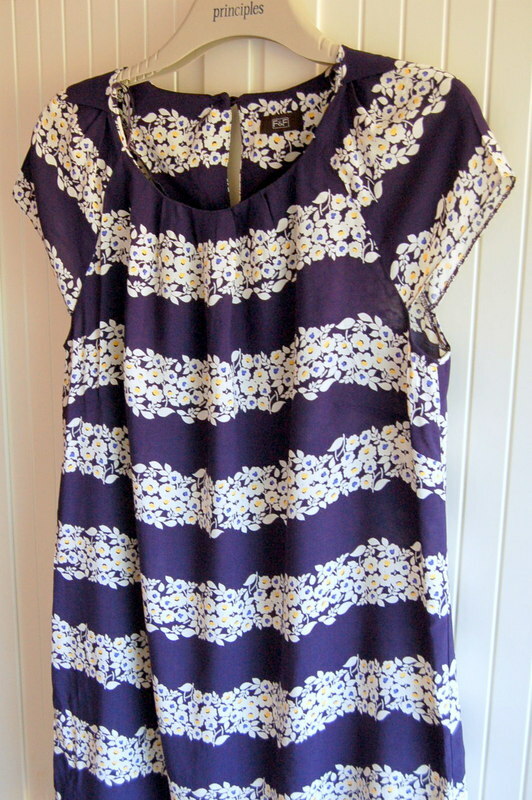 Love your little dress – it is so pretty. I have enjoyed the programme though it might appear daunting for anyone who has not made their own clothes before. I’d recommend the book, whether you have or not. I’ve not made anything yet (I’m going to try the tunic first), but the diagrams and instructions are clear. The dress you’ve made for your daughter is lovely. Thank you:) I’ve been wondering about buying it.. Spotted it on offer in a supermarket! Super dress, and great plan!